SOMETIMES I feel that Advent may be the forgotten liturgical season. Lent has fasting, prayer and almsgiving; Easter exults with the joy of the resurrection; Christmas has so many gifts, baubles and decorations associated with it that to recount them would almost be redundant; and for the rest of the year we seem to readily respond to the whirligig of memoriae, feasts and solemnities with an eagerness appropriate to our Catholic faith. However, I am yet to encounter that apparently rare individual who will exclaim, “Advent is my favourite time of the year,”, or “I can’t wait for Advent”. In fact, I suspect most of us would struggle to formulate an expressible thought on the purpose, meaning or significance of Advent. Maybe we would manage to work in the words “wreath” and “purple”, but probably not much more. As we approach the Advent season, I offer my humble services in alleviating this lamentable state of affairs and so dedicate this short article to the topic of Advent; if not quite forgotten, certainly the least understood of our liturgical seasons. I am sure most of us have been told that Advent – which comes from adventus, the Latin word meaning “arrival” or “coming” – is the period of time during which we prepare for the arrival of the long-awaited Messiah, the Saviour, the Redeemer, Christ the Lord, whose birth we will celebrate at the Christ Mass. Yet even as we nod our heads sagely in reading those words, we are tempted to pose the same question that a group of rather perspicacious children undergoing catechesis recently raised. Jesus Christ has already come, has he not? Jesus isn’t going to be born on December 25, 2018; He was born, more than 2000 years ago in Bethlehem. So, during Advent, what is this “arrival” for which we are preparing ourselves? Are we supposed to delude ourselves? Does the Church want us to suspend our collective memories for a few weeks and forget that Christ has already arrived? Each liturgical season of the Church highlights and focuses on a particular aspect of our Christian lives, because every day and each of our lives contains a bit of Lent and Good Friday, some Easter, a large amount of Ordinary Time, the occasional outbreak of Christmas – and some Advent. And so, to help us maintain focus as we continue our pilgrimage upon this earth, the Church employs the different liturgical seasons to emphasize for a particular time a specific aspect of our Christian existence. Advent is characterised as a time of waiting; a period of preparation for the arrival of the Christ Child. The Church stresses this sense of expectation and waiting in order to make present the ancient expectation of a Messiah; the sense of anticipation that people experienced before Jesus Christ appeared on this earth. That is the sense that we are supposed to cultivate during Advent: we are supposed to reflect upon and share the sense of what people must have felt before Jesus was born. In ruminating on what the world must have been like before the arrival of Christ, we more readily appreciate why people were so eagerly hoping and praying for a saviour. Yet a further question now presents itself: why should we cultivate this sense of expectation? After all, though such a reflection is a worthy exercise, it hardly has any true bearing on our lives today, does it? And if something has a beginning, it must also have an end. As Christians, we have specific beliefs about what that end will look like – Christ “will come again in glory to judge the living and the dead and His Kingdom will have no end”. The idea implicit in Advent is that, as we share in the ancient expectation and preparation for the initial coming of the Saviour, we renew our ardent desire for His second coming. This element of our faith – along with Advent generally – is often under-appreciated. Despite the words of the Mass daily reiterating our prayer for the return of Christ – “as we await the blessed hope and the coming of our Saviour Jesus Christ” – this sense of Christian expectation tends to cool over time. Hence Advent – the season during which those cooling embers are fanned anew. As St Cyprian says, “it is not enough for us to be content with His first coming; we must wait in hope for His second coming”. Consider the experience of waiting for someone at the airport. Recall the anticipation of meeting in person someone you have not seen for a long time. Is it a boring experience? Do you sit there twiddling your thumbs and kicking your heels? Hardly. You look towards the gate expectantly; you hope the plane arrives on time; you hope the person is not carrying fruit or vegetables, lest they be delayed by the customs authorities. You wander the arrivals lounge with butterflies in your stomach and a slight palpitation of the heart. That is the sort of expectancy the Church hopes to fire up within us during Advent. As we recall the birth of the Christ Child, we are also being asked to prepare for His second coming. It is part of the reason why the liturgical year begins with Advent; the whole year – our whole lives – should be lived leaning forward, as it were; expectantly, hopefully. There is also one further aspect of Advent that is often overlooked. 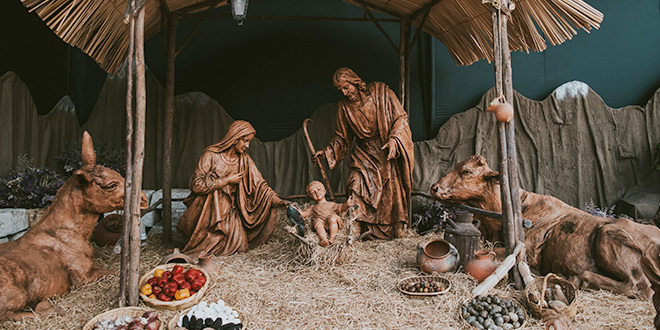 Jesus Christ came once – the tourist bureau in Bethlehem will be forever grateful – and He will come again at the end of all time, as we profess in the Creed. Given those facts, how many “comings” of Christ would you say there are? No doubt many of you readily responded ‘two’ with a slight roll of the eyes. And that is a fine answer; it makes admirable sense and has much to recommend it. But the great fathers and theologians of the Church when examining this question thought somewhat harder and longer than most of us and came up with a more profound reply. Christ will come three times. He came once – Bethlehem. He will come again – at the end of all time. Here, now, within us – in our hearts, if we truly long for it, expect it, wait for it and pray for it. St Bernard of Clairvaux describes this intermediary coming into our hearts as, “a road leading from the first to the last coming”. Advent evokes a sense of how the world must have felt before the coming of Christ. Advent reminds us that the final age of the world has already come upon us and that we should be leaning towards the end of all time with our whole lives. Advent recalls the fact that we ought to be living with a rich, expectant hope that Christ might dwell within us today in all grace. Advent exists as a liturgical season to place these Christian expectations more clearly before our eyes. As we look towards the eventual return of Christ the King, we ought also to pray that our own hearts become Bethlehem today.